Almost half of all flash flood deaths happen in vehicles. Moving water is very easy to underestimate. Driving through any sort of moving water can sweep your car right off the road, even in seemingly mild flooding as shallow as a few inches. Flooding can hide some monster hazards. Remember, the water is always the same on top. It's what's underneath that you can't predict. In any disaster, 911 may become completely unreliable. Even if you get through, there might not be anyone to respond. Even in your car, you should have enough disaster supplies to get you through a few hours or maybe days. Flash flooding can happen almost anywhere in the country. It's important to know how to avoid flash floods and what to do if you are caught in one. These tips were taken from FEMA and from the NOAA brochure, Floods: The Awesome Power (pdf). Never drive through a flooded road or bridge. Back up and try a different route. Do not stay in a flooded car. If your vehicle is surrounded by floodwater, abandon the vehicle and move immediately to higher ground. If your car is swept into the water and submerged, DON'T PANIC! Stay calm and wait for the vehicle to fill with water. Once the vehicle is full, the doors will open. Hold your breath and swim to the surface. If you are swept into fast moving floodwater outside of your car, point your feet downstream. Always go over obstacles, never try to go under. If you are stranded on something above the floodwater, such as a tree or building, stay put and wait for rescue. Do not enter the floodwater. Know the terms associated with floods and flash floods. Flood Watch Flooding is possible. Tune into NOAA Weather Radio, commercial radio, or television. Flash Flood Watch Flash floods are possible. Be prepared to move quickly to higher ground. Listen to radio or television for information. Flood Warning Flooding is occurring or will occur soon. Evacuate immediately if told to do so. Flash Flood Warning A flash flood is occurring. Move to higher ground immediately on foot. Don't rely exclusively on official warning. If flash floods are possible move to higher ground. Don't walk into moving water. Just six inches of moving water can knock you down. 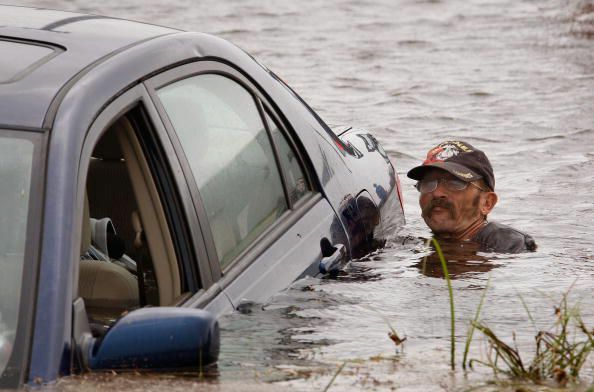 Don't overestimate your car's ability to drive through floodwater. Six inches of water is enough to reach the bottom of most passenger cars. Driving in water this deep is enough to cause a loss of control or stall the car. A foot of water will float most cars and two feet of rushing water will sweep most vehicles, including SUV's and pickups. If at all possible, avoid contact with floodwater. Floodwater may be contaminated with oil, gasoline, or raw sewage. Floodwater may also be charged with electricity from fallen power lines. Do You Know How to Survive a Tsunami?